In a medium saucepan combine rice and 1¾ cups water. Bring to a boil, cover, and reduce the heat to simmer slowly until tender, about 12 minutes. Fluff with a fork, spread out on a plate, and let cool. In a medium skillet heat oil over medium. Add garlic and pepper flakes and cook 30 seconds. Add zoodles and cook until softened, about 3 minutes. Set aside to cool. In a medium bowl whisk together peanut butter, coconut milk, fish sauce or salt, lime juice, and brown sugar. Add water a tablespoon at a time until sauce reaches the desired consistency. Fill a wide bowl with lukewarm water. One at a time, dip spring roll wrappers into water just long enough for them to become pliable. Place on a work surface. Place ¼ cup rice in the center of the wrapper, and top with ¼ cup zoodles, carrot matchsticks, cabbage, 2 cilantro sprigs, and 2 mint leaves. Fold left and right sides of wrapper in towards the center, then fold the side closest to you over the fillings in the middle and roll up away from you (like rolling a burrito). 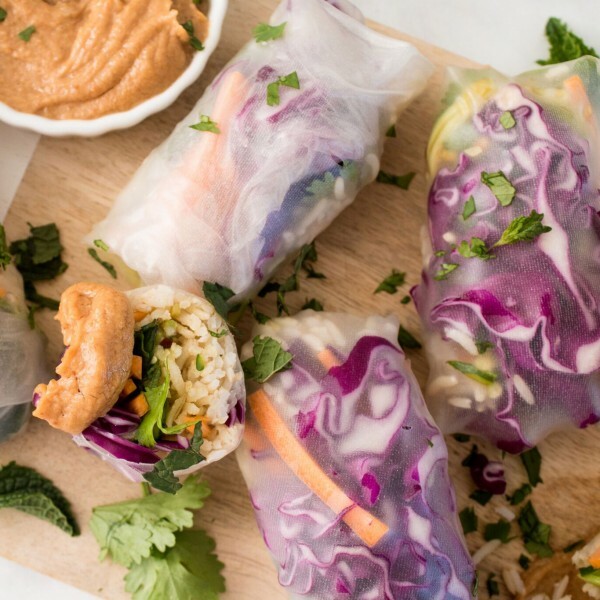 Repeat with remaining wrappers and filling and serve with peanut sauce.